You can buy Hyatt points through Daily Getaways at 1:00 pm EST. You can only buy 1 set of points for each deal. Hyatt normally sells points for 2.4 cents per point, which isn’t so great. But with this deal, you’re buying Hyatt points for 1 cent to 1.1 cents. You could save money buying Hyatt points instead of paying cash, depending on the hotel and your travel dates. 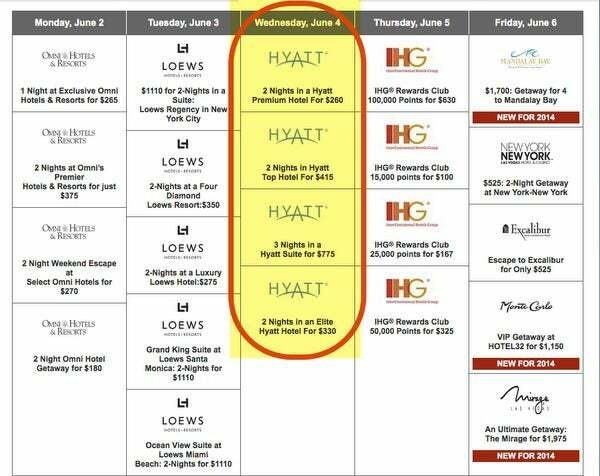 Buying Hyatt points made sense for all the hotels and travel dates I looked at, but you might get different results. 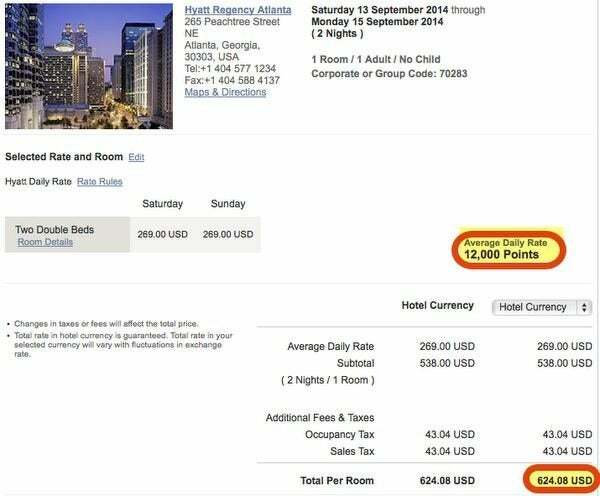 Two nights at the Hyatt Regency Atlanta on September 13, 2014, to September 15, 2014 costs 24,000 Hyatt points (12,000 Hyatt points x 2 nights). If you pay cash, you’ll pay ~$624. However, buying the 2 nights in a Hyatt Premium Hotel package for $260, you save ~$364 (~$624 price on Hyatt website – $260 points cost). The Kayak rate is cheaper than the rate through the Hyatt website, but it doesn’t count towards status. Even if you booked through Kayak, buying points will save you ~$318 (~$578 price on Kayak – $260 points cost). 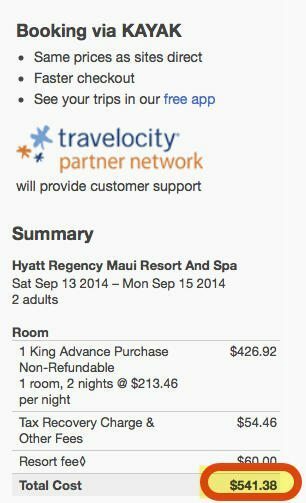 Two nights at the Hyatt Regency Maui on September 13, 2014, to September 15, 2014 costs 40,000 Hyatt points (20,000 Hyatt points per night x 2 nights). You’ll pay an advance purchase, non-refundable cash rate of ~$598. However, buying the 2 nights in a Hyatt Top Hotel package for $415, you save ~$183 (~$598 cash cost – $415 points cost). And you can cancel and get your points back! Even if you booked through Kayak, buying points will save you ~$126 (~$541 cash cost – $415 points cost). 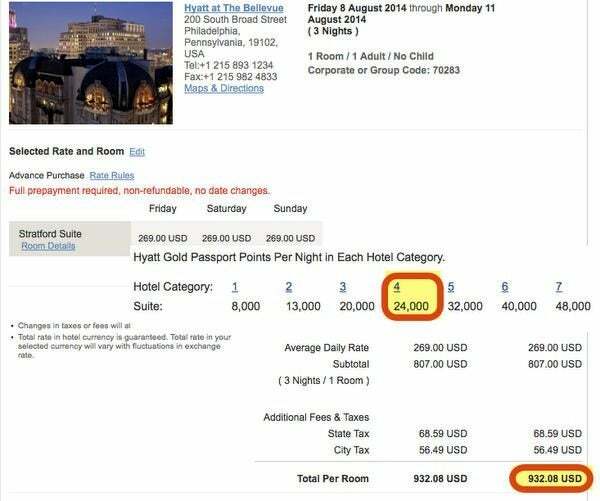 Three nights in a suite at Hyatt at the The Bellevue Philadelphia on August 8, 2014, to August 11, 2014 costs 72,000 Hyatt points (24,000 Hyatt points per night x 3 nights). You’ll pay an advance purchase, non-refundable cash rate of ~$932 from the Hyatt website. And you can’t book suites on Kayak. 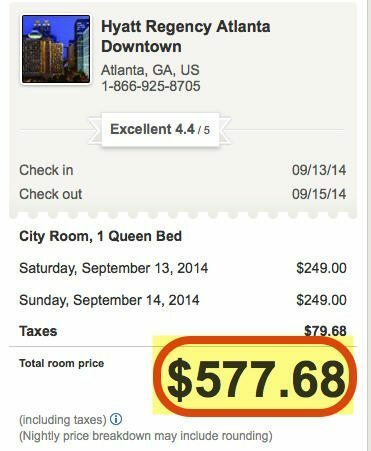 Kayak sometimes has cheaper rates, but doesn’t show you the rates for suites. You have to click through each listing and you may then get the option to select a suite. However, each time I tried, I wasn’t able to get a rate on suites. 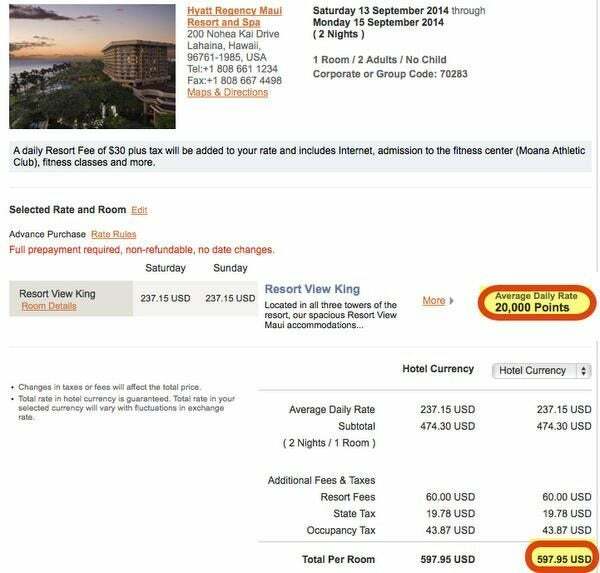 However, buying the 3 nights in a Hyatt Suite package for $775, you save ~$157 (~$932 cash cost – $775 points cost). And you can cancel and get your points back! 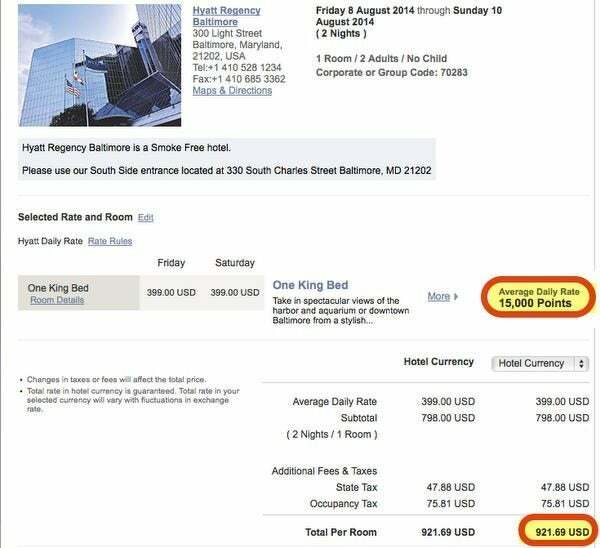 Two nights at the Hyatt Regency Baltimore on August 8, 2014, to August 10, 2014 costs 30,000 Hyatt points (15,000 Hyatt points per night x 2 nights). You’ll pay a cash rate of ~$922 through the Hyatt website or Kayak. However, buying the 2 nights in an Elite Hyatt Hotel package for $330, you save ~$592 (~$922 cash cost – $592 points cost). You can transfer Hyatt points to certain airlines (sign-in required), including Southwest. Transfers are in increments of 5,000 points, so for every 5,000 Hyatt points you get 2,400 Southwest points. When you transfer 50,000 Hyatt points, you get a 6,000 point bonus. So transferring 50,000 Hyatt hotels points to Southwest gets you 30,000 Southwest points or ~$426 in Southwest travel (30,000 Southwest points X 1.42 cents is the value of a Southwest point). You’re paying $775 for ~$426 in Southwest points so it’s not a good deal. Point transfers can take up to 4 to 6 weeks, but in my experience they transfer within 1 week. And transferred Hyatt points count toward the Southwest Companion Pass! The Southwest Companion Pass is 1 of the best miles and point perks that Emily and I have. Why? Because it allows a companion to fly for almost free wherever you travel on Southwest – on paid and award tickets. But all 4 versions of the Southwest card have a 50,000 point bonus. So you could just get 2 Southwest cards instead of buying Hyatt points. You could save money buying Hyatt points through the Daily Getaways instead of paying cash. Buying Hyatt points made sense for all the hotels and travel dates I looked at, but you might get different results. You can also transfer Hyatt points to earn Southwest Companion Pass points. But it’s cheaper to buy Choice points if you want to transfer to Southwest for the Southwest Companion Pass. But be sure to do the math to see if buying points makes sense for you. @Natalie – We didn’t try! They were sold out after 1/2 hr. Darius, were you or Emily able to buy any? Yep, this is one helluva deal! I’ll be waiting at the as the clock ticks down. Good luck, folks! Last year all offers were gone in the first SECOND, not minutes, so guys, forget about it!